When Silvano I2YSB and Adriano IK2GNW in 2002 went back from Austral islands the promise was to come soon in the Pacific.As usual the dilemma was where to go next. The Marquesas Islands lie between 600 and 900 km south of the equator and approximately 1600 km northeast of Tahiti. They fall naturally into two geographical divisions: the northern group centered around the large island of Nuka Hiva and the two smaller islands of Ua Pou and Ua Huka, and the southern group of Tahuata, Moho Tani and Fatu Hiva, clustered around the main island of Hiva Oa. With a combined area of some 2,000 square km, the Marquesas are among the largest island groups of French Polynesia and were formerly a major center of east Polynesian civilization. The islands are of volcanic origin, the eroded and partially submerged peaks of extinct submarine volcanoes. Craggy mounts and peaks transverse the interior with jagged spurs and spines rising to over 1,200 meters. From these lofty central mountain ridges, deep valleys cut by mountain streams flanked by precipitous cliffs sweep down to the sea. Narrow strips of black volcanic sand beaches form at the valley mouths while on flanking sides, sheer ridges plunge steeply into the sea. The Marquesan coast has no fringing reef or coral-clad lagoons, and the sea, although rich in resources, yields its bounty unwillingly. 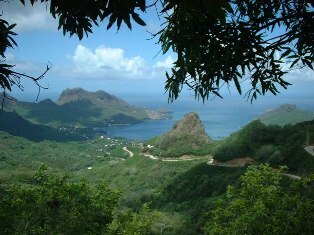 The climate of the Marquesas is subtropical and much affected by the prevailing winds and vagaries of seasons. Moisture-laden clouds carried by the southeast winds water the coasts on the south and east sides of the islands, nurturing a dense mantle of exotic vegetation. The northwest coasts are relatively arid with scattered groves of stunted trees, dry grass and patches of struggling ferns. The first European to visit the Marquesas was Alvaro de Mendana, who arrived in 1595, named the islands Las Islas de Marquesa de Mendoza and claimed them for Spain. Nearly two centuries were to pass before the next white visitor, Captain James Cook, arrived in 1774. Cook's expedition had the effect of opening the Marquesas to the outside world. Within a relatively short time, other exploring voyages were made and by the early nineteenth century merchants, whalers and missionaries came in numbers to the islands in search of adventure, wealth and/or destiny. With little respect or comprehension for the people upon whom they had intruded, the early European visitors had a dramatic and destructive effect on the Marquesans and their culture. The introduction of firearms, alcohol, and a multitude of diseases decimated the local population and contributed to an element of self-destructive anarchy. In their endeavors, the Catholic missions were enthusiastically supported by the French government, which had formally taken possession of the islands in 1842. With neither side interested in compromise, conflict became a significant component of interaction between the Marquesans and the French. Gratuitous violence which occurred beyond the norms and controls of Marquesan culture engendered a legacy of fear and mistrust and this, coupled with disease, apathy and demoralization resulted in a birth rate that was appallingly low. By 1872, fewer than 6,000 Marquesans were still living. The situation continued to deteriorate until in 1923 only an estimated 2,000 Marquesans remained. Thus, one hundred years of sustained contact had resulted in the almost complete destruction of the Marquesans and their culture. Today, the Marquesas are still hauntingly beautiful. The great valleys are silent, but imbued with the presence of a once-powerful people. Everywhere the remains of great stone platforms, walled house sites and terraces provide silent testimony of a culture that no longer exists. Exquisite artifacts and tools of daily living (those that remain) are found only in European museums and collections, far from the homeland where they were created and used. The French still maintain a presence in the Marquesas, although there is little left to govern. Dreams of a thriving commercial and trading centre proved illusionary, and although the local birth-rate is gradually increasing, the current population numbers are impacted by out-migration to Tahiti and France. 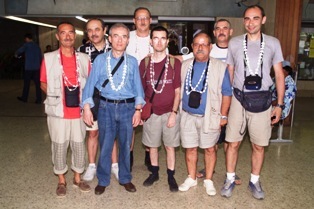 After the “low profile” 2003 Austral dx’expedition, Adriano and Silvano decided to organise a more ambitious activity from Marquesas forming a seven element crew and Flaviano I2MOV, Carlo IK1AOD, Andrea IK1PMR, Marcello IK2DIA and Beppe IK2WXV jointed them. To summarise a two-week experience in such a far country is not an easy task, we tried to share tough though the exiting days with the DX and the island hunters. To get the CEPT license (FO/ home call) is not complicated and it can be easily done by fax. So easy that Adriano decided to make it more complicated asking for a special call taking advantage of the century celebration of the famous French painter Paul Gauguin who died in the Marquesas island on May 8th, 1903. 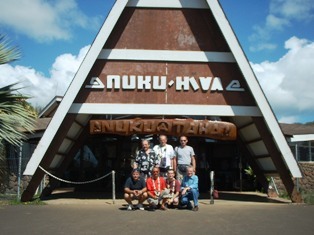 The TX4PG special call was issued thanks to Sylvain FO5RF, a friend met during the Austral DX’expedition a year ago. In Paris the security caught Flaviano and Carlo, the former for the Kent key, the latter for a 300W solid state amplifier. The metal quantity was too much for the sensors and only the captain could authorise its embark on the Boeing 747 to Angeles and Papeete. After reassured the captain that the radios cannot be used during the fly, we got the permission to embark on the aircraft. Papeete is already very hot at 6 am, as soon we are with our feet on the ground, we are warmly welcome with the traditional shell necklace and flowers. As soon we start collect the luggage, we realise that Mr. Murphy is giving his peculiar welcome: a bag is missing, just the one which contain the Steppir antenna motors as well as the cables for the radios and the power! We are desperate and the time to embark on the next fly is short. At the check in counter, another bad new, Air Thaiti allow 3 kg hand luggage only and we cannot accept the risk to stow our radios and laptop into the hold! In the while a distract traveller brings back the missing bag which he collect by mistake. In spite of all, we feel better now! At 1,000 am (20,00 GMT) the ATR42 taken off with all our stuff (a total of 245 kg). Only our wallets were lighter: 490 Euro paid to Air Thaiti for 84 kg overweight. It was useless arguing with Air Thaiti which has the monopoly of domestic flights in Polynesia.The first island was Rangiroa where we stopped 30 minutes; then we landed in Nuku Hiva, the final destination of our long trip. At the airport a pick-up and a Land Rover were waiting for us.The weather was really bad, a heavy rain of over 30 C° and 100% humidity. We had to climb up to Takao mountain, 1220 meters above the sea, along a muddy road without the parapets with the wheals of the cars skimming the sheer drops.After two hour drive in such a bad condition to cover 27 km, we finally arrived at Toovii, a plateau at 800 m.a.s. We planned to install a station there, to facilitate the contact with Europe since the other stations would be in Taiohae, the main city, down in front of the ocean and closed by a mountain crown. It was Sunday, April 27th and the sun set early. At 18,00 local time it was already dark. The rain, still heavy, and darkness make not possible to install the beam antenna. But we were too excited to stay inactive waiting the day after that a first 30m vertical was erected under the rain and Beppe started to operate, announcing that the TX4PG was on air.Adriano and Carlo will remain in Toovii together with Beppe for the next four days while the other operators leave for Taiohae, another 45 minute drive in the dark, where Christiane e Claude, the owners of the Pension Pua, are waiting to accommodate them in two bungalows which will be the second station.The night was still long and the rain still strong but, in spite of that, the R7 multiband vertical was rapidly erdected and the second station was ready to operate.At the sunrise we started immediately to erect the three element 6 bands in order to complete the setup of the two stations close to the sea. Than Silvano and Marcello left again for the station on the hill to complete the setup. This was the main station with a TS-440 and a IC-706 MK, an amplifier TL-922, the 2 element Steppir (monoband beam from 20 to 6m), a vertical for 40/80m, another vertical for 30m, a beam and a vertical for 6m. The weather was still horrible, there were 20cm of water on the soil and the 80m vertical refused to work because of the immersed radials. Unfortunately it was not possible to rise them out of the water since the horses were free to walk everywhere breaking all the wires. This was a really unexpected situation but in spite of that, some dozen of qso were in the log before the antenna was definitively out of order on 80m. Now we understood that Mr. Murphy was still with us since other bad news came during the day, a strong storm in the morning dropped the three element antenna on the ground and a couple of elements were definitively broken. The repair was not an easy task without the tools and spare tubes, in the rain and under the attack by a number of annoying mosquitoes (the local people call them “nono”), the only solution was to sacrifice one element, a hard job for Silvano. At the end the two element was ready, and in spite of the crooked tubes the antenna was working well on all the bands. 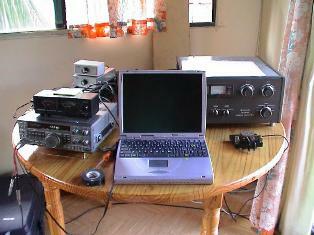 At Taiohae, a city at the sea level, the two station were equipped with a FT-847 and the 2 elements 6 bands, a TS-440 with 300W solid state amplifier and vertical R7. Since the two station were very close, a band filter were used to avoid interference. We had some WHF radios to get in touch with between the station on the hill and that on the sea but even with 50W the link was not possible because the mountain was in the middle. The only way was to settle some daily skeds in HF. Late afternoon a further problem occurred in the, in the station on the hill, i.e. the TS-440 modulation was horribly distorted and the operation was not possible. We were forced to use the spare IC-706 MK which we intended to dedicate to the 6 meters. The magic band were monitored only during the most promising time. The climate was really uncomfortable and even early in the morning, at the sunrise it was very hot and humid. Some of us go shopping which took 3 km walk under the scorching sun or under the rain. Furthermore, the tap water at the Marquesas was not drinkable and, when available, it was brown! In addition to the technical and logistic problems, the propagation did not assist us, especially in the first phase. Late morning and early afternoon were the worst periods; we know the Europeans were disappointed because they couldn’t hear us but we were there, calling CQ with two beams towards Europe (which was also the USA direction), often in CW, and with a TL-922. Thursday 29. We learn from Taina, a girl in charge of the housekeeping, that the rain season started in April and reached the top in July. The best month was December, she said, with no rain and mosquitos.So we realised what the information we received from our correspondent did not correspond to the Marquesas reality! Another problem was to update the logs on line. They are often only partial because of difficulty to travel to the group in Toovii, on the hill. In addition, the taxi fare was 50 Euros, (not to mention the risk!) Furthermore, the internet connection was unreliable and restricted, we could not connect to the net not every days and when it was possible, just for half an hour. Wednesday 30. 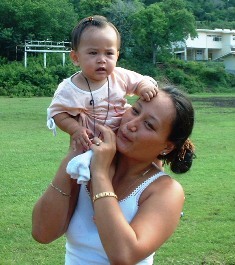 Silvano and Andrea climbed up to Toovii to replace Beppe and Carlo who moved to Taiohae. The turnover was planned to allow everybody operating four days from the hill since the station position by the sea was not so favourable for DX. Down by the sea the receivers were dump during the day, no propagation at all, better to take a bath in the ocean (no coral reef and few small sharks swimming around us). Swimming in the ocean was a pleasure, our only concern was about the small sharks, were their parents somewhere close to us? It was already the May 1st. The static noise was so heavy nightime that it was impossible to operate on 80 meters. Even on 30 and 40m the static was strong but in CW we were able to put many Europeans in the log. The signals were very low there and it seemed is even worse for them! We had no others alternative than to operate on 30 and 40m CW with the station by the sea than and to operate on 20m all mode with the radio on the hill. We had at last a short opening on 6 meters around noon (22,00 UTC) covering a restricted area in South America only; ZP6CW was coming very strong, he was in log on SSB and CW, together with some other ZP and PY. In the afternoon the pile-up was huge with the USA and Japan till sunset. The propagation phenomena with EA8 and CT area was impressive, the signals were so strong to cover the USA pile-up on 17 meters. But as soon as we called “EU only” no further signal was coming from west, just like a solid wall built along the 6th meridian! Friday 2. We still had rain and the R7 started showing a high SWR on 15 and 17 meters. A serious problem occurred in the TL-922 which we could fix. At last we had a good opening with Europe for a couple of days during the week-end. Signals were solid on 20 meters from 5 to 9 p.m. local time (03-07 UTC) and we could work Europe from the sea stations on 30 and 40 meters CW, in spite of the poor operative conditions. On the hill 20 meter was a very profitable band, we often received 59+ reports from many Italian stations. Pile up with Europe was huge, we were forced to work split calling by number and we were happy to say “hallo” to a number of friends, their signals were coming 59+! On RTTY we decided to operate mainly on 20 meters to give as many stations as possible the new on the digital mode, thus avoiding dupe qso. Even there the pile-up was unbelievable! At nightime, after 10 p.m. local time (08 UTC) the propagation on 20 meter dropped also on the hill and we often moved to CW, the mode in which the qso was possible even with weak signals. We also could not disturb of the other operators who were sleeping in the only room available. The week-end gives us the chance of good opening at nightime on 15 and 17 meters. We operated CW for hours calling “Eu only” at reduced speed because of the “pole echo” and a number of European DX’ers were in log on 4 bands. More difficulties on 12 meters, only few calls from EA8, EA6, CT were in log. Saturday 3. Again a good opening with Europe on 20 meters. In spite of the ARI contest qrm, a number of new European calls were in log, thanks to the week-end. Also the 17 meters kept open the full night and the station on the hill exploited the band with huge pile-up to Europe, even from the north. What a big difference from the first days! Sunday 4. A new turnover, Flaviano and Marcello moved to the hill and Silvano and Andrea come back to the sea.In the log there are more qso on CW than on phone; considering the set up this con be normal. Marcello and Adriano tried to balance the situation by working 12 and 17 meters SSB during the day, RTTY on 20 meters in the evening and Flaviano during the night on CW.There was no choice for the station by the sea, only the CW could assure a reasonable qso rate with the rather poor antennas situation and barefoot, Monday 5. The propagation was going down, all operators were making their best to keep the qso rate high even if the signal were weaker and weaker. An agent from the “Gendarmerie” came to check our licences, they were ok and he left us in peace. Thursday 6. The propagation did not help us anymore, it was really bad. In the morning we used the automatic call on CW and the answer were very rare, even Australia and New Zealand were absent. Nobody was listening to us from this land 6,000 km away from the nearest continent.We had enough time for a quiet breakfast. The qso rate was too low, one every 10 – 12 minutes, only few weak W6 or W7 appeared every now and then we had enough time to rest in between two qsos! Some of us took the advantage of the poor propagation to go a sightseeing, thanks to the courtesy of one of our guests who drove us around the island. Wednesday 7. It was time to, we had to pack our stuff for the travel back. At 9,30 the last antenna, the Steppir, was down and the team jointed in top of the hill after to being spread for so many days. 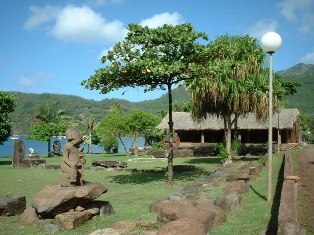 The former three-element beam, back from the two expeditions in Niger and some field days, was sheltered at Taiohae available for Jean Claude FO5LZ, the taxi driver, the sole sleeper radio ham in the Marquesas, hoping he could find interesting to be active from this wonderful place! At the airport, as expected, we had to pay for the overweight again despite we had left some stuff on the island. We took off from Nuku Hiva and we arrived in Papete in three hours. It was time to have good meal all together and to sleep in a comfortable hotel. Even if was not a five-star hotel it was a big improvement compared to the bungalow at the Marquesas with brown water from the tap! A journalist came at the airport on Thursday morning a to look for us. She was invited by Sylvain FO5RF and his wife Martine to interview us for a local newspaper and our group was of some interest since there were not so many news there! She promised to send us the article and the pictures.We embarked on the aircraft wearing shell necklaces.At 9,15 the Boeing 747 took off for Los Angeles and Paris and finally we landed at Milan Malpensa after a 27 hour trip.Again we discovered that Mr. Murphy had not remained at the Marquesas but he had followed us to Milan; as soon Silvano opened his hand luggage, the anode was swinging inside a 3-500Z bulb though spite it was well packed.For some reasons the luggage were not sent on the same flight but finally we collected them the day after. If you were so patient to read our story you can understand that it was not a relaxing vacation in a Mediterranean Island but a demanding trip from the physical, technical and economical point of view.We would like to thank all friends who congratulated us for our efforts and would be grateful for the “new one”. Thank you also for those who sent us constructive critics, comments and suggestions. We cannot understand those who wont to operate on the bands or as they like without knowing the problems we must face there like technical problems, bad weather conditions and the vagaries caprice of propagation in south Pacific. FO5RF, FO5QG, FO5PS, I1HJT,I1UJX, IK1AZK, IK1CEH, IK1IZB, I2EPT, I2PQW, I2UUA, I2WOQ, IK2BLA, IK2OIU, IK2UTT, IK2UWR, IK2VIL, IZ2AEW, IW2NMX, I2-3551, EA2RC, K9LA, W6OAT. And finally a special thank to DL5EBE Dominik for the invitation to Friedrichshafen to explain or adventure.